grandma's cookie jar: Waterballoon Pinata! We are enjoying our two days of fun - reason for this late post today. I want to take just a minute to let you know about something simple and fun you could do with your grandchildren - my grandsons are LOVING it! Waterballoon Pinata! 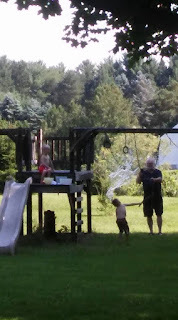 Just grab some balloons, fill them with water, knot them off, tie them to a branch or - as we did - to a playground, grab a stick and get ready to get - as my grandson said - "totally wet!" Fun, simple and memorable . . . what could possibly be better on a hot summer day!